Short but dynamic, Janet Platt from Highland keeps busy with a lot of things and doesn't do any of them half way. She is a hair dresser and a real estate agent, but her real love is sewing. She designed a ruler to make sewing picots easier, got it patented and is currently in the process of getting it on the shelves of sewing stores. It was a long process to get the "Quick Points Ruler" marketable, but not following it through was not an option for Platt. Picots, or Prairie Points as they are dubbed in the mid-west, are squares of fabric folded and ironed diagonally twice, then tucked into each other half way, and used to edge quilts and other hand-sewn items. Platt, who has been sewing since she was 8 years old, now has nine sewing machines. They don't all fit in her sewing room where she also has cutting tables and ironing boards. Her dream is to someday have a sewing room big enough to set up all nine machines at once. "I love, love, love fabric," she said. She has a cupboard along an entire wall plus a walk-in closet filled with yards and bolts of cloth. "I will be dead before I can use all my fabric," she said with a happy shrug. She said the ruler came about because she is always trying to figure out how to do things quicker and easier. "I'm a perfectionist so I want it done right but I don't want to spend forever on it," she said. "The invention came about basically because of lack of time." With this tool, she can take a long strip of fabric, center it on the ruler, cut, fold, iron it into the picots, and sew it along the bottom edge. The picots come out in a continuous strip, tucked into one another at even intervals ready to apply as edging. It eliminates the measuring, cutting each square separately, and hand spacing, which takes much time. The process of getting her ruler to this point has taken about five years. "First I had make a prototype to show my patent attorney," she said. "He had to do patent search to make sure nothing like it had been patented before. "Next I had to get it manufactured," Platt said. She had to go to three different plastics manufacturers before she was satisfied with the final product. The ruler is made of clear plastic Lexan—which is not only flexible enough to twist and curl, it also lies back down flat. It comes in three sizes, 30 to 34 inches long, to make one, one and a half and two inch picots. Once these rulers are launched, Platt plans to put out smaller ones for scrap bookers. To get the rulers ready for marketing Platt had to write out directions, have a logo designed and package the rulers for sale. Platt's first order came from local sewing store, Nuttall's Fabrics, which will put the rulers in their five stores in Utah. "Chad Lopez down at Nuttall's has been encouraging me through this entire project," Platt said. Platt said, as the process of getting the ruler on the market proceeded, she had a lot of help. "Those people I needed came into my life quite naturally," she said. "One of my hair clients happened to mention he had gotten a notice from the city that a patent attorney, Chad Copier, was setting up a business right across the street. I went and talked to him and it was a fit." "My friend, Dawn Smith designed the logo and my daughter, Lindsey Easterly, created my Web site," Platt said. "We are originally from Wisconsin, so when my husband, Brian, was back there visiting he showed the ruler to Nancy Zieman—a sewing and quilting expert whose national sewing show, Sewing with Nancy, originates from Wisconsin public television. When she saw the ruler she said, 'I think this will be on my top 25 list next year.' I do hair for another lady whose daughter wanted to buy a house. When I got her daughter a killer deal on a house in Lehi I found out she and her husband did marketing. Dane and Barbara Quittner of D and B Marketing are now my marketing people and have been so great," Platt said. Barbara Quittner said she enjoys working with Platt. "She is so full of energy and her ideas are so creative," she said. "Her enthusiasm is contagious. I can't wait to see what she comes up with next." 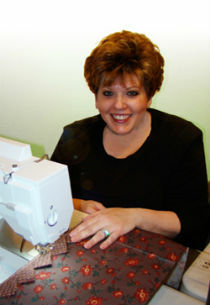 Platt is demonstrating her ruler at 11:30 a.m. on May 10 at the Home Machine Quilters Show at the Sandy Expo Center. At this point when everything is coming together to make her invention a reality Platt said it is quite overwhelming. "I feel like I'm living someone else's life," she said. "The success is kind of surreal." However, Platt's philosophy is: "There are no accidents. If you go for something with all your heart, the way will be opened for you—but you have to work hard and never give up."